A peek into the world of psychology through the lens of eCommerce professionals. The road to persuasive design is a long, winding road. There are countless things to consider, each weighing in heavy to the overall success of a webshop. 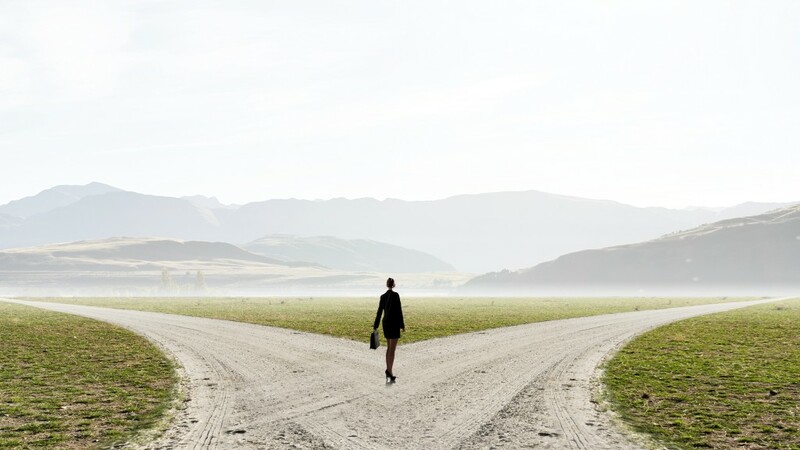 And in today’s digitalized world, where much of a eCommerce brand’s influence centers around their website, these decisions can make or break conversion success. Ultimately, the goal of webshop design is to persuade its users to buy a product. To reach this goal, your webshop should be geared to offer an optimal user experience that tailors to your audience's wants and needs. 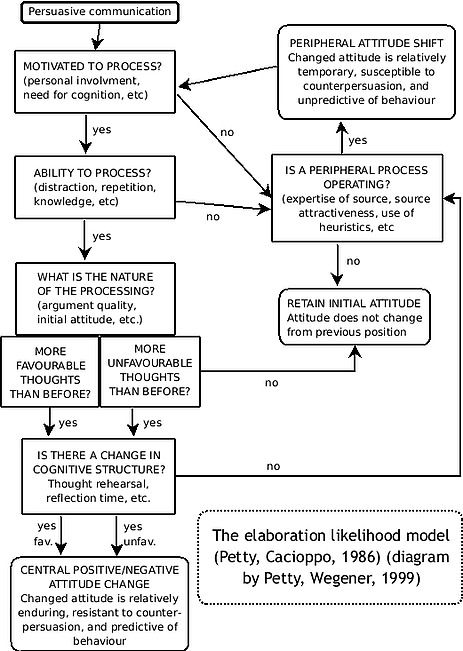 The Elaboration Likelihood Model (ELM) of persuasion was introduced by Petty and Cacioppo and is one of the most frequently cited decision-making persuasive models. It argues that attitudes shape behaviors. And one's attitude toward information (given, for example, on a website) depends on the level of effort they are willing to expend to understand the message. This model suggests that there are two main routes to persuasion, the central and peripheral. The route a person takes is dependent on the level of effort they want to put into understanding the message or how involved they are. In other words, if someone is motivated and able to buy a product they will be highly involved. And those who may just be browsing, and thus, are not motivated and/or able are less involved. When it comes to the route that a person takes, if they are highly involved will be more likely to take the central route and those less involved will take the peripheral route. Highly involved individuals characterize the central route in the ELM. Those who take this route do not only want to spend the effort to understand a message, but they also have the ability to do so. For example, imagine Charlie intends to buy a new summer jacket. Charlie is highly involved because he has a mission purchase a jacket to replace his current. Based on this, he is both motivated and able to process the information. So, according to the ELM, Charlie will take the central route to persuasion. Being in the central route means that there will be more attention on the content of a message. One's initial attitudes will be formed based on the strength and relevance of the arguments provided. After processing these arguments, the initial attitude of the viewer will either be accepted as favorable or not. So, let’s say that Charlie goes to the Nudie Jeans website, searches through the jackets, and chooses several that meet his style standards. Because he wants to find a good substitute for his current jacket, factors like the material, weight, and fit are important. This landing page is optimized for those who are highly involved. It provides the practical information like the material, fit, and weight of the jacket. 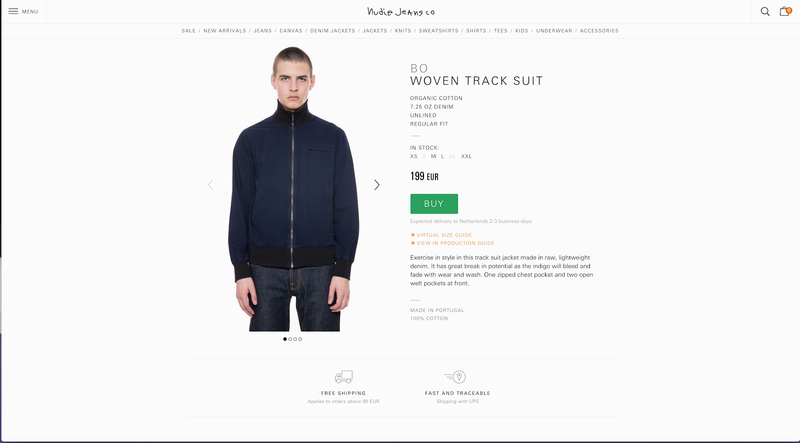 Plus, it offers a convincing "argument" regarding how to wear the jacket. At the same time, it doesn’t overload the user with useless information that doesn’t aid their decision-making. On the other side of the spectrum are those who are less involved. Meaning that these individuals are either not motivated or able to process the information (or both). Heuristic cues (i.e., visual triggers) will be the central persuading principle for those in the peripheral route. These cues could include the use of certain colors, photos, animations, or labels. For those in this path to persuasion, logical arguments don’t weigh as heavy as they aren’t likely to expend the effort to analyze and consider them. Again, to put this idea into practice, let’s assume the Anne is just browsing the ASOS site out curiosity and maybe a bit of boredom (we’ve all been there - am I right?). She doesn’t have anything specific in mind, so she’s just scrolling through the main product page. Since Anne is in the peripheral route of persuasion, other factors than the content's message will influence her most. So, on the product lister page, she may be influenced to click on specific products based on visual cues. For example, the "exclusive" products may drive her to click on as this label subconsciously implies that the product is scarce. And, according to research, scarcity drives behavior because individuals have the natural instinct to buy products that are limited. Other factors that may influence Anne’s behavior is the way the models look, background colors, quality of the images, etc. Upon clicking on a given product. Elements such as the "Free Delivery and Returns", the color of the "Add to Bag", or even the iDeal payment option could help persuade Anne to finish her conversion. However, keep in mind that the attitude that is developed based on these visual cues does not always predict behavior. The attitude is relatively temporary and could be counter-argued if, for instance, the price is too high or something else catches her attention. To bring these concepts together, you may have already picked up on the fact that there are a lot of crossovers. For instance, the Nudie Jeans example has tags on the bottom of the page indicating "Fast Shipping" that is "Fast and Traceable." These serve as heuristic cues for those in the peripheral route or additional arguments that convince a visitor in the central route to make a purchase. The ASOS example has extensive product information, which can act as additional arguments to either support or discourage persuasion. Additionally, the "Exclusive" label can also speak to someone in the central route as that encourages extra motivation to click, add to cart, or purchase. Since most people tend to use both routes of persuasion to some extent, a design that caters to both paths is essential. But keep in mind that the path that they are primarily in (central or peripheral) will also determine how stable their attitude is for the given product. Charlie, for example, after taking the involved central route will be quite firm in his choice. Whereas, Anne might need some additional encouragement to finish her transaction. Plus, like previously mentioned, you can target both levels of involvement through the integration of motivation inducing messages. 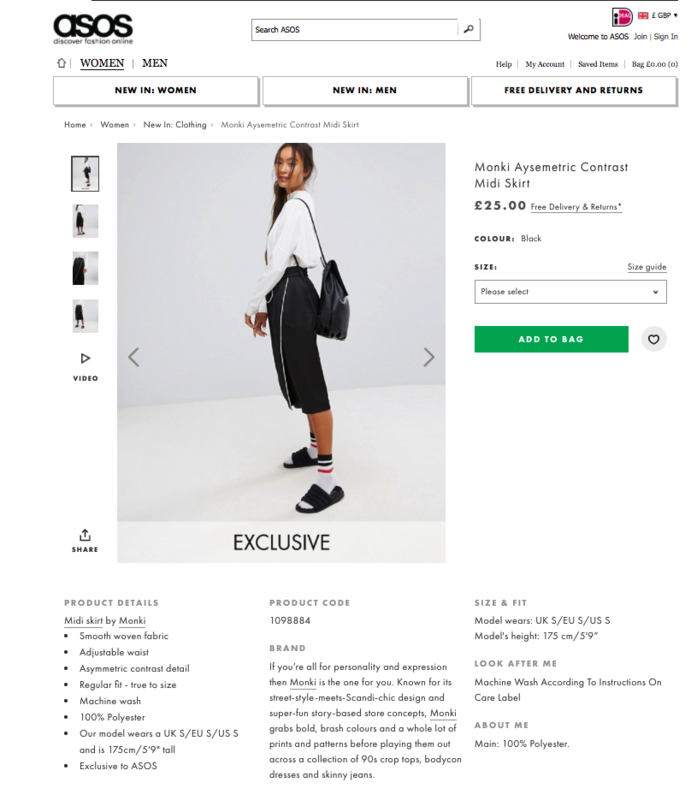 Like the exclusive product tag on ASOS, these can be in the form of other persuasive triggers like product tags, smart notifications, native nudges, and interactive overlays (see our white paper for more on this). Designing your website to create a better customer experience is a top priority for the modern retail company. A standard one-size-fits-all approach is no longer suitable for brands that want to maintain sustainable growth. By designing your website in a way that speaks to visitors of all involvement levels, the likelihood of a positive attitude - and ultimately, conversion - increases. **Update: Check out our article on the BJ Fogg Behavioral Model to learn more about the persuasion model modern companies and user experience agencies are using today.